I don’t know if you are aware of this, but the inner solar system has a visitor. This cosmic guest traveled from the icy depths of space and now basks in golden sunshine. These colorful wanderers intrigue humanity, causing us to blame our misfortunes on these uninvited guests. Wars… famines… sacrifice… are these symptoms of some malignant presence? I’m talking about Comet Lovejoy! A strange green blob, easily visible in the northern night sky. You have a telescope or binocular. I encountered some technical difficulties while searching for Comet Lovejoy. I scanned a few maps eight hours before venturing outside, so needless to say, I didn’t exactly know where to look. A binocular can bail you out of a jam. If the object is bright enough (which it was), all you need to do is scan a particular patch of sky and hope for the best. I know, I know, very scientific. Good news: my suspicion of where Comet Lovejoy proved to be correct. 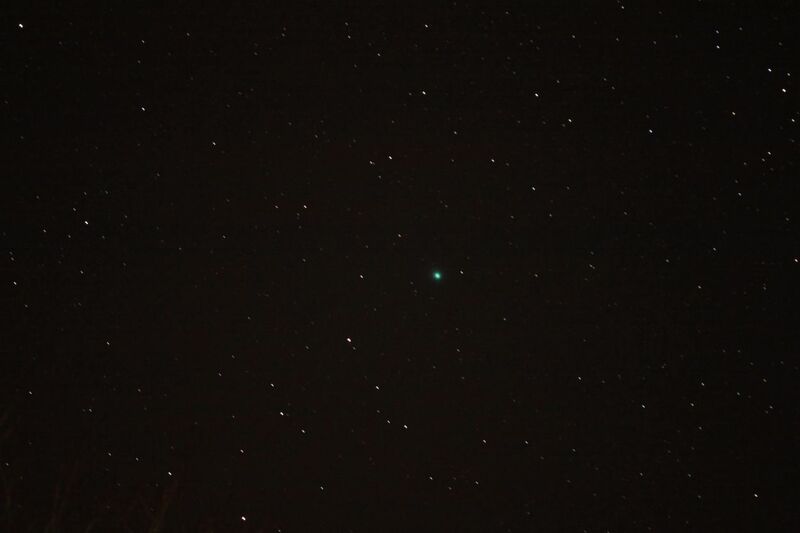 My binocular resolved a fuzzy ball—it was Comet Lovejoy. The binocular I used was a Orion 10×50, so my power was limited. I was still impressed with the view, despite the lack of telescopic magnification. Comet Lovejoy looked like a hairball—of the feline variety. I observed a scraggly wispyness, wrapped in a diffuse sphere. No tail was visible. 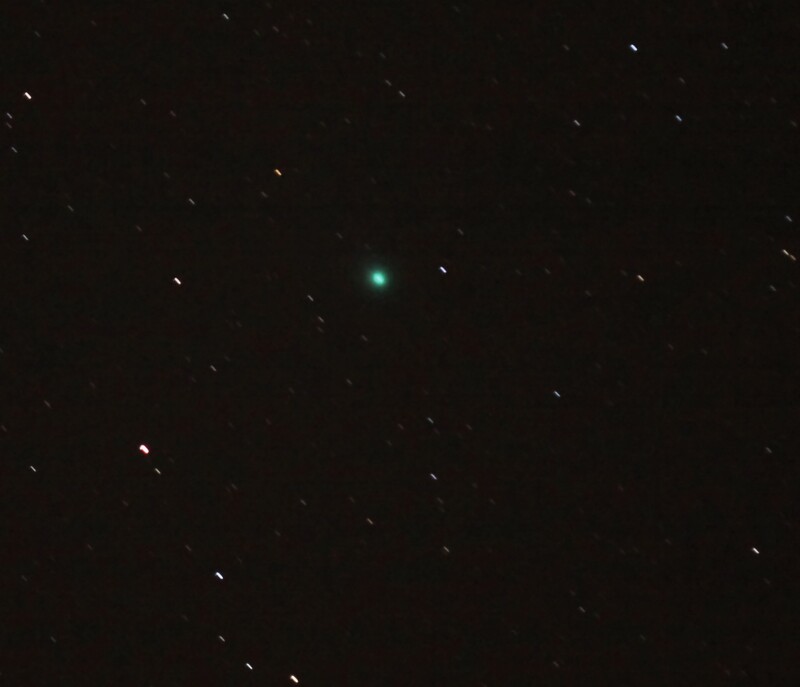 Comet Lovejoy is famous for its distinct greenish hue. The color is impressively apparent (with long exposure photography or very dark skies). Guess what? If you were unfortunate enough to inhale a whiff of Comet Lovejoy—eyes would bulge from your face—as noxious fumes dissolve the delicate walls around your cells. Just kidding. Kind of. Comets are notoriously poisonous: sunlight cooks up nefarious chemicals, resulting in a greenish bloom, or coma. Diatomic carbon atoms are easily excitable and emit the telltale glow as they simmer into a less energetic state. Ultraviolet radiation brings out the worst in everything. Do you want to know how to find Comet Lovejoy? Click—here. I am a fan of these images though! I’m a fan and I’m envious, both at the same time. A Boy and his Blob is an old school NES game. You run around, feeding a blob jelly beans, which gives it powers. Depending on the flavor of jelly bean — the blob will morph into a ladder, bubble, umbrella, pit, and a variety of other forms. It’s a difficult game — pissed me off greatly. I remember a lot of old school NES games, but nope, not that one. Sounds like it would piss me off greatly as well. Nice! Did you notice a greenish tint? Some people are able to see color (if you have access to dark skies). 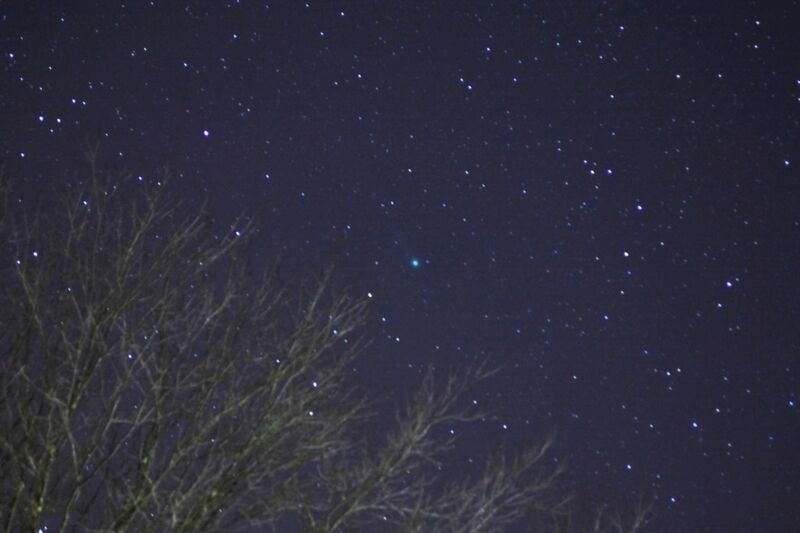 I photographed Comet Lovejoy about an hour ago — however — I still haven’t observed it with my telescope. What kind of telescope did you look through? No it was white and blurry. Lots of light pollution in my area. I’m not sure what type of telescope, the kind a junior high planetarium would own. Probably a refractor. I hate light pollution! How close will lovejoy be to earth? And who names these comets?! Comet Lovejoy’s closest approach happened on January 7 and it was about 70 million km away. As for the nomenclature — I believe Lovejoy is an Australian amateur astronomer. He discovered the comet a few years ago, so in honor of his efforts, the comet was named after him. Sure! Sounds like a plan!